Beautifully crafted this Silver Plated Bread Basket is made of brass and silver plated to enhance the beauty of your dining table at breakfast time. A nice gift for everyone's dining table. We are offering customized products. 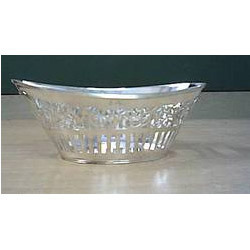 We are counted amongst as one of the leading organizations of excellent quality Silver Basket. 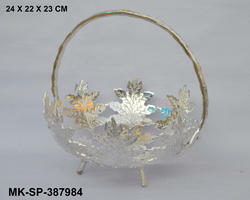 Beautifully crafted Fiber Basket in Silver Color. Can be used as flower baskets or as gift items. As these artticles have a layer of pure silver all over, the look wear like pure silver articles, the effect of the atmosphere food on them is also the same.